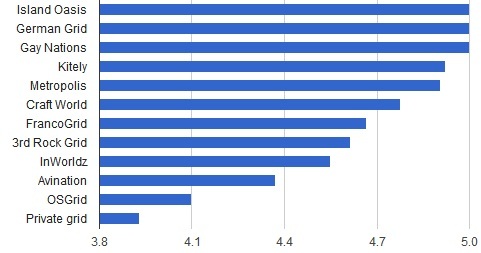 The results of the 2011 Hypergrid Business grid survey are in, with mid-sized grids serving language communities dominating the rankings. A record 459 people submitted responses this year, with a total of 63 different grids visited — up from 194 respondents and 35 grids last year. The most surprising result was Avination scoring the lowest of all grids on its overall rating, and at or near the bottom on content, technology, community and support. The top scorer on overall quality was Island Oasis, a mid-sized grid with 43 regions and 997 registered users. Nine respondents wrote in the name of this grid as the grid where they spend the most time. Island Oasis also scored tops in content, community, and support, and second overall in technology. German Grid, with 77 regions, 2,858 registered users, and 294 active users, scored second overall, also with nine respondents. 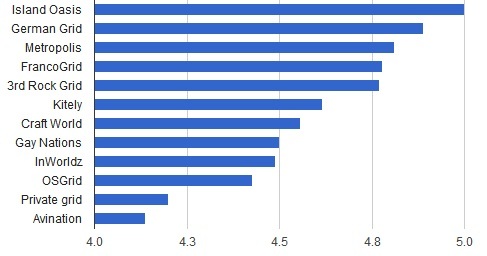 German-language Metropolis was third, French-language FrancoGrid was fourth, and 3rd Rock Grid was fifth with 21, nine, and nine respondents, respectively. Kitely had a surprising showing, with 72 respondents giving the grid an overall score of 4.6 — where 5 was a rating of “excellent” and 4 “very good.” Kitely only launched this past spring, and is still missing many features common to other grids, such as teleports between the regions on the grid. However, this was offset by Kitely’s ease of use and innovative cost structure. Italian-language Craft World, with 140 regions, 1,677 registered users, and 187 active users was seventh with 14 respondents. Gay Nations, with 136 regions, 513 registered users and 70 active users, was eighth with six respondents. 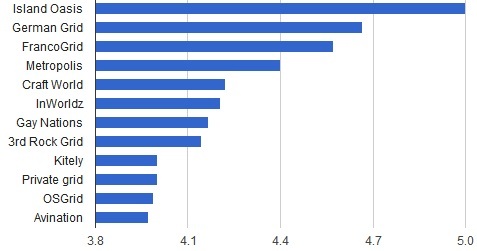 Of the most active grids, InWorldz saw the highest ratings, with an average overall score of 4.5 with 143 respondents. InWorldz currently has 845 regions, 48,731 registered users, and last week reported 4,500 active monthly users. OSGrid was next, with 96 respondents giving it an average score of 4.4. 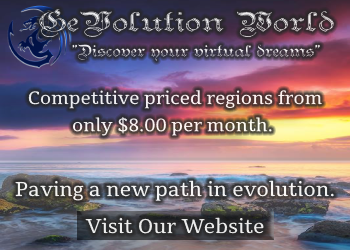 OSGrid currently has 9,963 regions, 69,741 registered users and 3,507 active users. 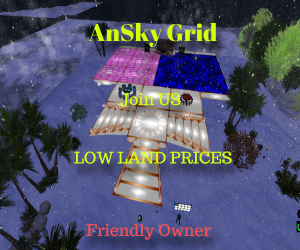 Unlike closed commercial grids, OSGrid allows people to connect home-based regions for free, resulting in uneven performance across the grid. Avination saw the lowest scores, with 72 respondents giving it an average score of 4.2. Avination scored below private grids — company, school, personal grids and even grids-on-a-USB-stick. Avination currently has 632 regions, 42,606 registered users and 3,420 active users. After a meteoric rise to the top last winter, Avination has been seeing a steady decline over the past few months in both regions and active users. 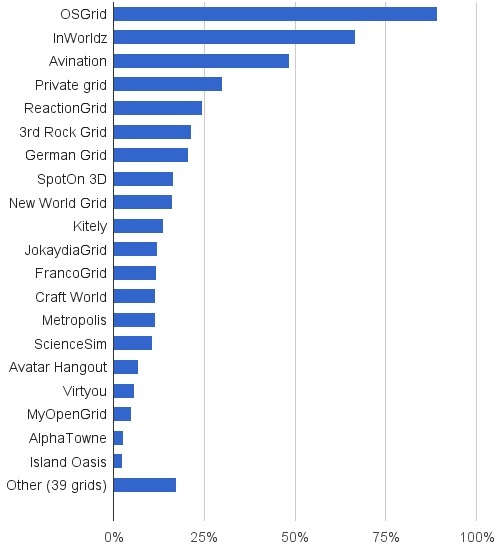 All other grids had five or fewer respondents rating them, including ReactionGrid, SpotOn 3D, New World Grid, JokaydiaGrid, ScienceSim, Avatar Hangout, Virtyou, MyOpenGrid, AlphaTowne, Dorena’s World, OpenNeuland, Nova, Haven, MOSES, OpenLife, RolePlayWorlds, Virtual Highway, Aurora Test Grid, DestinyZero, GerGrid, IcaruS RealmS, Nirvana, SimWorld, Tertiary Grid, Twisted Sky, Virtual Worlds Grid, Wilder Westen, YourSimSpot, 2nd Life, Arda, Astra Grid, AvWorlds, New Genres Grid, NextLife, NZVWG, OneWorld Grid, Pseudospace, SecondLearning Grid, UFSgrid, and Virtual RP. 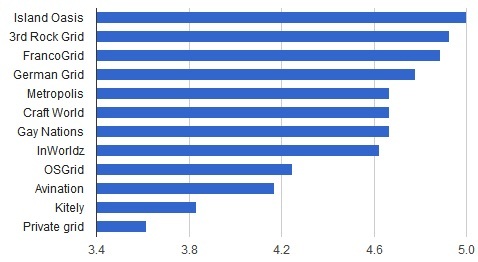 Private grids and Kitely scored the lowest on community, which makes sense given that private grids tend to have few users, and Kitely has only recently been adding community-oriented features like the ability to find popular regions. 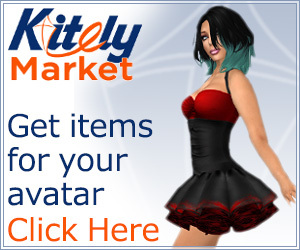 Avination — surprisingly for a commercial grid — had lower scores for content than the non-profit OSGrid or private grids. One downside of running your own sims is that you’ve got nobody to turn to for tech support — and the ratings bear this out. Respondents were happy with German Grid’s technology infrastructure, while disappointed with Avination — even though its founder is an OpenSim core developer. 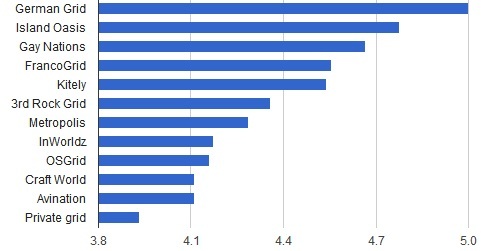 Percent of respondents who visited each grid. OSGrid lived up to its reputation as the cross roads of the hypergrid, with 89 percent of all respondents having visited the grid. InWorldz was in second place with 67 percent, and Avination in third with 48 percent. Meanwhile, 30 percent of all respondents had visited some kind of private grid — company, school, individual, or Sim-on-a-Stick. This was up from 22 percent last year. Many people wrote in with comments about their grids, and we’re reprinting a representative selection of these quotes below. Please note that all comments were submitted with the assurance of anonymity. In general, comments were overwhelmingly positive, with respondents praising their grids’ communities, founders, and support. This is only to be expected — people were asked to rate the grids they spend the most time on, and few people would spend time on a grid that they did not like. Despite that, there were some critical comments about Avination and InWorldz. People complained about gambling on Avination, and a lack of physics, mesh, and other new features on InWorldz. In addition, although most people were happy with the community on the grids where they spent their time, some respondents said they had problems on Avination, InWorldz, and OSGrid.